I have a confession to make. I am a huge fan/lover of box-brownies. I love them for many reasons, the obvious being that it’s chocolate (duh!!). 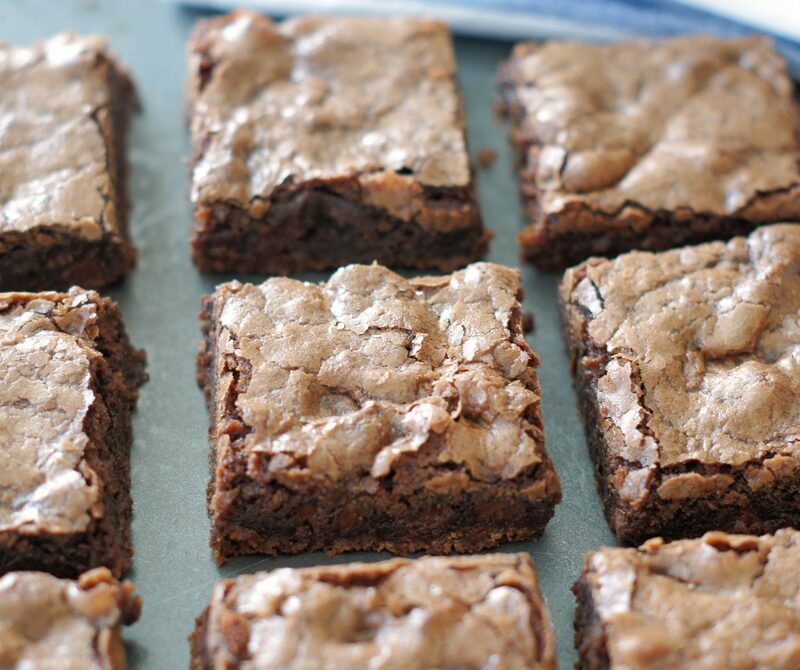 I also love box brownies for their chewy texture and crackly tops. Does anyone else out there feel the same? Now, don’t get me wrong I love homemade brownies, especially the brownies I grew up on. But sometimes I just find myself wanting/craving/making a boxed brownie mix. I know, call me crazy! The other day I made these Chewy Brownies and it was love at first sight because I could see they had the crackly tops and were going to be fudgy and chewy. They were out of this world and I before I knew it, I’d eaten an entire row all by myself. I’ve now made them twice in the last week and I think I’d better not make them again for awhile because I can’t seem to stop eating them. I fed the missionaries in our stake over the weekend and we had these brownies with ice cream and homemade chocolate sauce. I’m pretty sure they would gladly come back here for dinner. The great thing about these brownies is how simple they are to make. They are made in one bowl and you don’t even have to pull out your electric or hand mixer. Easy peasy. And remember, you can never have too many brownie recipes in your stash. 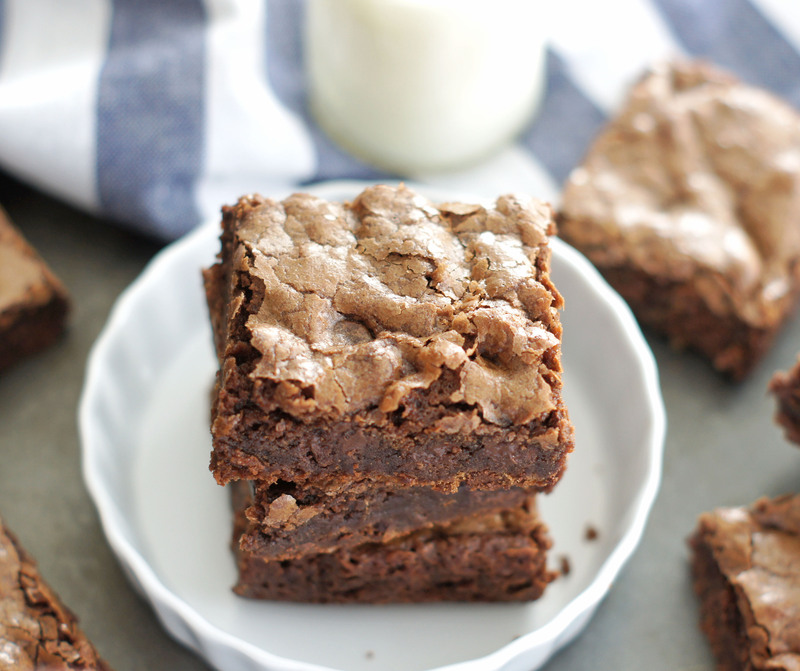 Fudgy, dense and chewy and crackly tops. . .my favorite things in a brownie. These one-bowl brownies are a cinch to make and taste amazing! Preheat oven to 350 degrees. Line a 9x13 pan with foil and spray with nonstick cooking spray. Whisk cocoa and boiling water together in large bowl until smooth. Add unsweetened chocolate and whisk until chocolate is melted. Whisk in oil and melted butter (mixture may look curdled, but don't worry.) Add the eggs, egg yolks, and vanilla and continue to whisk until mixture is smooth. Whisk in sugar until fully incorporated. Add flour and salt and fold in with a rubber spatula until combined. Fold in chocolate chips/chunks. Evenly spread batter into prepared pan. Bake for 30-35 minutes or until toothpick inserted in center of brownies comes out with a few moist crumbs. Remove from oven and let cool on a wire rack for at least an hour. Gently remove brownies from pan using foil. Return brownies to wire rack and let cool completely, about 1 hour. Make sure you allow several hours for these to cool, the longer these brownies rest, the better they are. I love your recipes, Jodi. I have made many of your brownie recipes and I will be making this one too. 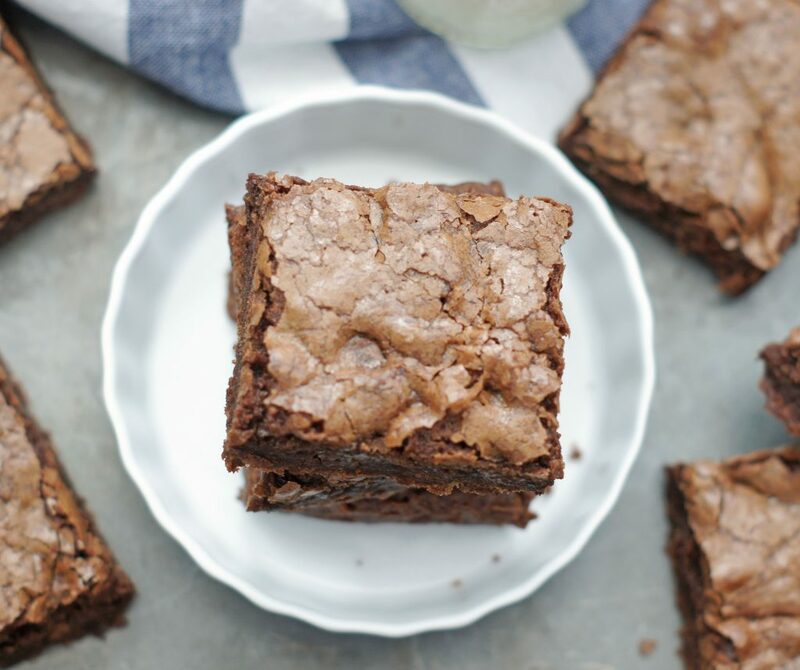 If you haven’t tried the Trader Joe’s Truffle Brownie Mix, it is seriously the best! Hi Shelley, thank you for the sweet comment. 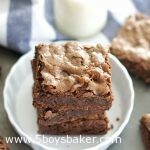 You will love these brownies, they are so dense and chewy and the crackly top is my favorite part! Ok, I think I’m going to have to make a trip to Trader Joe’s today, thanks for the tip! Have a great day! I didn’t get a shiny crackly top! hmmm, what did I do! They also turned out rather cakey . Oh I seriously hate when I don’t get the shiny, crackly top. I’m sorry you didn’t get that with these. I’ve never had that happen with this recipe, but I have with my family’s favorite recipe (Aunt Elva’s Brownies). I wish I could tell you what you did wrong, but I’m not sure that I know. I’ve read that it has something to do with mixing the butter and sugar together really well and then beating really well after the eggs are added in. You can google it and read a lot of different ideas about. Sorry I’m not much help. If you try them again let me know how they turn out. Hi Jodi, how kind of you to respond! Ok, so I just had to try again and OMG!!!!!! perfection, success! You wont believe this, but seriously, I have been on a brownie quest. I lost my perfect recipe 20 years ago. Ive tried 34 different recipes since…I even have a spread sheet with my comments. hahahah. I ran out and got more ingredients today and I am so happy I tried again. Nice shiny crackly top. The best chew, which is what I was searching for…that chew. My search is over. These will be my go to brownie. Would you mind if I post them on my blog? (I have a food blog too) I will of course let everyone know it is your recipe! Thank you thank you. As you can tell, I take my brownies very seriously!!!! hahahah. I am soooo glad these worked for you the second time. They are absolutely delicious and chewy, which is why I love them. That is hilarious that you’ve kept a spreadsheet with comments, I love it. I can’t believe you’ve tried 34 different recipes. Of course I don’t mind that you post this recipe. I will definitely have to check out your blog. Thanks for letting me know they turned out for you. Take care.